Belogradchik rocks is the name of a natural (or maybe artificially-assisted natural) phenomenon spread on the area of about 80 sq km, surrounding the town of Belogradchik. It contains numerous rock formations going for some 30 km in length and about 7 km in its widest part. Literally, there are thousands of rock formations. The three poligons include most of the rock formations. 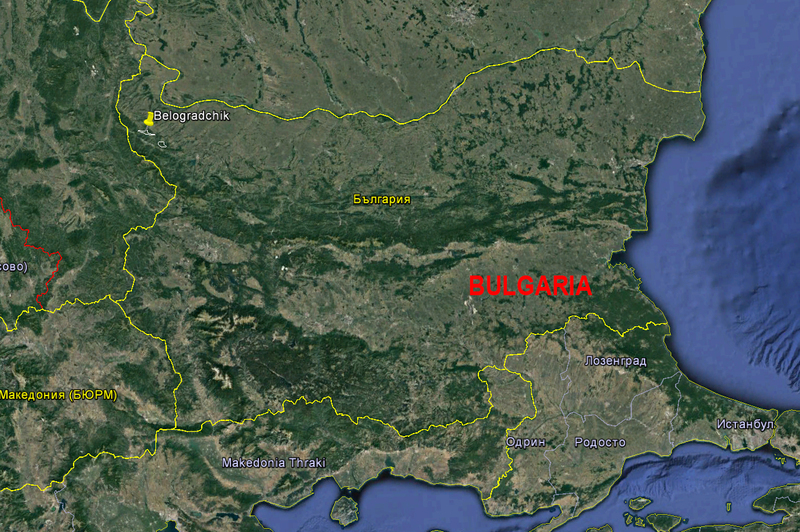 They are named after the near town of Belogradchik. This slideshow does not represent all of the rock shapes and formations as they count for thousands. These are some of the most known and famous and they serve as to obtain some idea of the rocks. To see the rocks, one has to visit the place and indeed this is also not really enough as Belogradchik rocks spread on some 80 sq km. I personally have seen only 40% of them regardless of the fact I live at this place. It takes walking along the numerous trails among the rocks. A simple division of the rock formations can be done as it follows: animal shapes, human shapes, faces, balanced rocks, arcs, rock walls and reflectors. Many of the shapes resembling human and animal shapes depend on the viewer’s imagination though there are some which need no imagination at all. When you walk along the rocks if you are used to paying attention to your feelings and your mind is not too busy with various issues, you will experience something pretty interesting. At every single place among the rocks there is a different feeling which overwhelms the human being. One can experience it best if they are alone. The feeling comes naturally from the very place and is not caused by our reactions to the place. If you go back to the same place again and again you will have the same feeling every next time which is to demonstrate that the feelings are caused by the places. One needs such observations because otherwise they can attach this phenomenon to their own momentary states and to miss the link between the feelings and the rocks. For sure, you know that feelings are remembered in the same way one remembers tastes, smells, melodies. The feeling is the sixth sense and it can be developed just like the other five senses which are related to the body. Through them we analyze and get to know the physical reality. Through our feelings, which has no specialized body organ and is not linked to material reality, we experience and get to know a different world. The very fact that feelings exist and works shows that there is also another reality apart from the material world. It may not be materially manifested but it exists just as much really. Among the rocks feelings change very rapidly by walking along. If you go ahead just 100 or 200 meters or if you just go to the other side of a rock you will feel in a completely different way. This means that there is a very variegated mosaic of feelings along the rocks, i.e. the world which has not been materially manifested in really diverse in this area. At other places this phenomenon is not observed in such a degree. Feelings change there as well but by going much bigger distances and by getting from one vicinity to another. 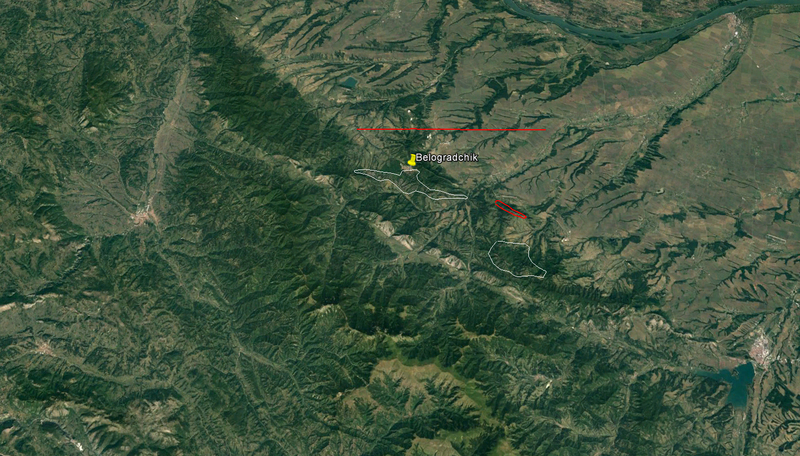 And among Belogradchik rocks these changes happen over very small distances, i.e. the feelings cells are very densely placed. It is as to have a large castle with many and many rooms every one of which contains a different aroma. 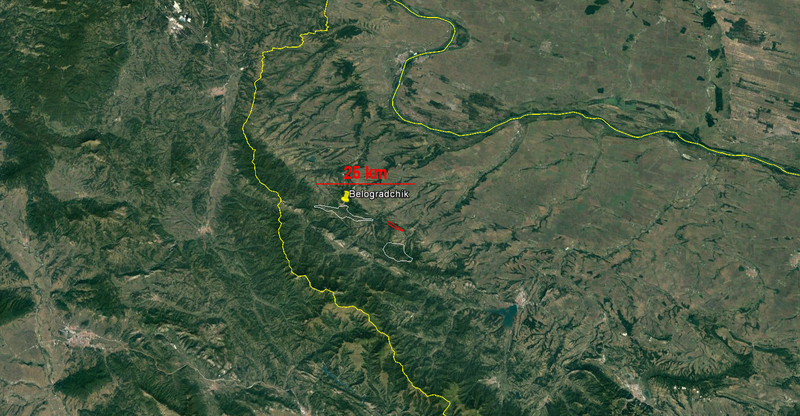 Imagine now how large Belogradchik rocks are – 30 km in length and up to 7 km in width. In your mind, separate this into similar geometric figures with size 200×200 meters and you will get some 2 000 -2 500 emotional states. Maybe this is more that the ability of human beings to recognize the types of feelings, this is something large. Some energy must be present in every of these states and the energy must be shaped in a different way comparing to that found in the rest of the places. Probably, the rocks themselves with their shapes and displacement deflect and overlap energy beams in such a way that they create a unique model for every single place causing a unique feeling there. This is completely possible because the shapes of the rock formations are very diverse and complex as well as their mutual disposition and in the same time uncountable energy beams pass through this space. I would compare this to a large area of mirrors various in shape, size and disposition where one or more people point lights. Imagine, how many light patterns would be created there. Passing from one feeling to another stimulates the sixth sense and thus develops it. The same happens to all other senses. If there was no taste in the world or everything tasted the same way, then we would not need this sense and it would never develop. It would not even exist. Yes, it can be argued that taste is an interpretation of our body and mind of substances which themselves have no taste at all. It is completely possible to be so. But the logic is again true. If there was only one picture all around the world eyes would be completely unnecessary. If the pictures were two and they altered eyes would develop only to the extent where they can recognize which of them was actual at the moment. The pictures would have been pre-integrated in our mind and our primitive eyes would only detect which of them was present at the moment. This would not lead to any development of the sense because there would not be any need of development. The richness and diversity of tastes, smells, sounds and melodies, pictures and views make senses develop in order to be able to detect more and more shades. Mind, brain, soul, reflection and comprehension develop as well as to be able to process all the information from the senses. Therefore the rapid change of feelings among Belogradchik rocks favors the development of our sixth sense as it is a stimulus for it. If the artificial urban environment created more or less uniform and unilateral feelings and this reduces the development of feelings, Belogradchik rocks – in the opposite direction, makes feeling sharpen to their most. This is like the skill of reading – it is developed with reading. Therefore, walking along the rocks we develop our feeling in a very high extent. The book „The Esoteric Legend of Belogradchik Rocks“ deals in detail with the nature of these feelings. Here we only need a small number of suggestions as to create the basic idea. On the one hand, the different feelings among the rocks may be due to the very complex reflection, refraction and overlapping of the energies. On the other hand, the rocks may be a very complex type of Zen which stimulates the senses and evokes reflection and meditation – just as if some God has created them in order to affect us while we observe them. On the third place, if we follow the basic story in all legends about the origin of the rocks, we reach to the idea that one all of them used to be alive but then they were petrified. Thus every single rock may still contain its former consciousness and presence. There is a local cave just 3 km to the north from Belogradchik rocks. It is called Kozarnika cave. Archaeological excavation are still in progress there – for one month every year. I am not authorized in any way to present the findings therefore I must declare that the following represents only my interpretation of what has been discovered having in mind that I do not know all the facts and I am not a specialist. The archaeological excavations at Kozarnika cave started in 1996 and since then some very interesting discoveries have been made there. One of them is a tooth of an early type of human dating some 1,4 millions of years which is the first known human presence in Europe. It dates from the same period. After some discussions whether the indents have been created by chance while scraping the meat from the bone or they had been done intentionally, it was considered that the indents are part of the earliest discovered calendar, i.e. they represent an abstract record. No other similar discovery has been made and I suggest that for some reason local human community was able and/or was forces to reach higher states of development unlike human populations at other places at the same time. Discoveries of various periods all over the time since 1.6 mln years have been made. And now we move to a much more recent period of time – some 40 000 BCE – the time when modern people came to existence. 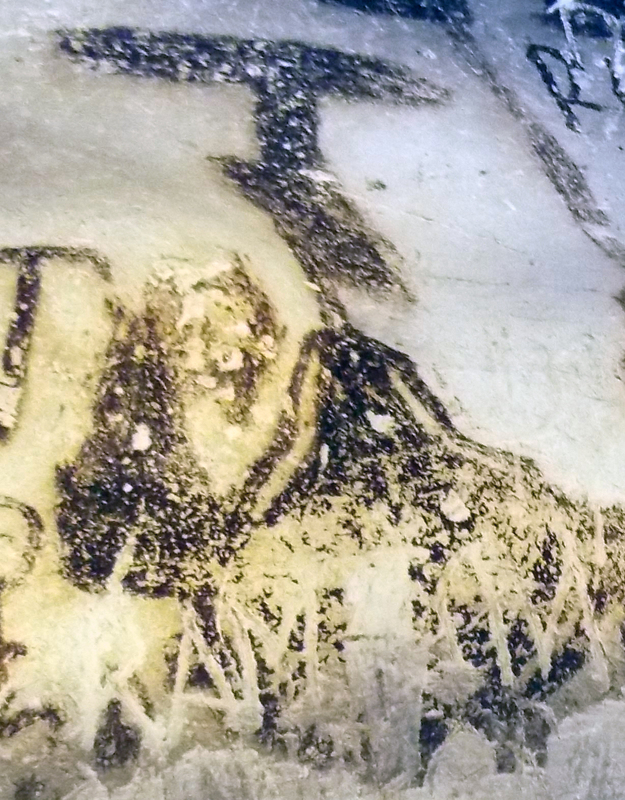 There are two very interesting scenes in Magura cave which concern the appearance of modern mankind according to my researches. Of course, I do not represent nor oblige anyone with the results of it. The first of them is the so called „Hunting scene“ named so after obvious reasons – a number of men hunt. Of course, we should never stop at the obvious but should pay attention to details as there are many details and every one of them intends to transfer information to us. The first thing we see in the scene of „hunting“ is that it is separated in two distinct levels. Human figures in the lower level and human figures in the upper level look very different and have very different occupations. Always when there is a scene in two levels, the upper level is divine and the lower level represents everyday life and activities. And, indeed, we see that the people in the lower level are occupied with hunting – and everyday activity. The second thing we see about this scene is that there are three types of people, all of them represented by the distinguished style of the paintings which is the way to express the information about them. with very schematic bodies which means they are on a low stage of development – they are natural, non-educated. The erection is a way to express that they are driven by instincts. So, these two are natural, primitive people. The arms put in a circle around the head symbolize the consciousness, the development of mind and the enlightenment. And the double-triangular bodies mean divine origin. 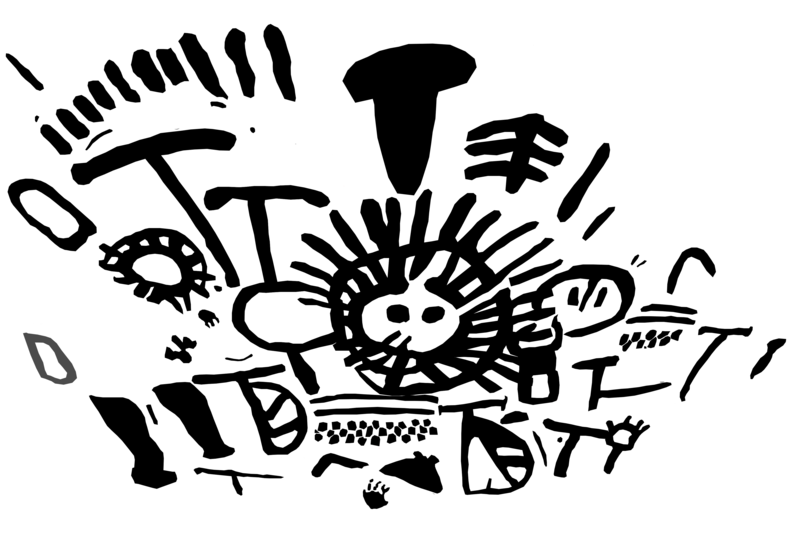 The triangle pointing down is the intention of spirit to obtain shape and to have lower experience. This symbolizes the Goddess-Mother who puts the spirit into shape, i.e. into flesh. The triangle pointing upwards is the spirit, once in a shape, trying to be free again. This symbolizes the God-Father. All of them are educated and skilled to do specialized work but none of them is given the enlightenment and consciousness. These people represent the civilization the basis is which is the specialization of knowledge, skills and work. Therefore this scene describes how the civilization was and is created. This scene contains very important information about the history of modern mankind and more precisely for the emerging of the Fifth race and its fate. But now I am going to talk only about one part of the scene – the strip at the top of it. This strip allows us to date the events on it just knowing a few basic things. The beginning of the history is some 42 680 years ago – in the beginning of the cosmic era of Virgo. But in Bulgarian we use the word Deva [deva] to which we assign the meaning of a virgin but this is not the original meaning of the word. Deva means God. Therefore Magura paintings state that the origin of modern mankind (the Fifth race) was some 42 680 years ago in the era of Virgo, i.e. in the era of God. The sudden beginning of the strip means there was no evolution but this does not concern the body but concerns what lives inside the body. It means that there was some event during which the internal being was enlightened and then people realized they are people. 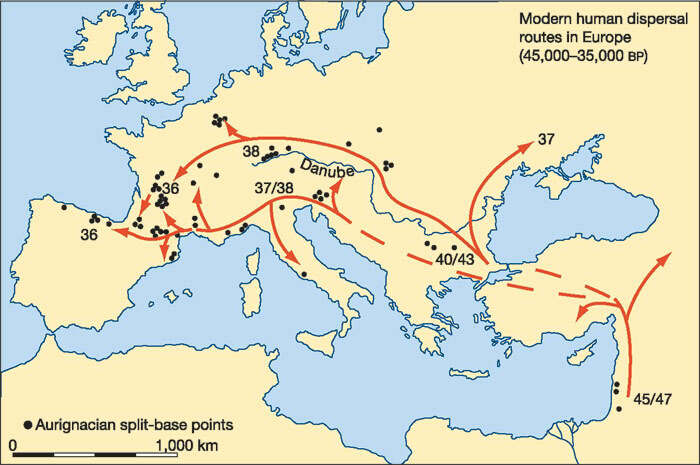 This maps shows the migration of Cro-Magnons. The numbers show the age in thousands of years. 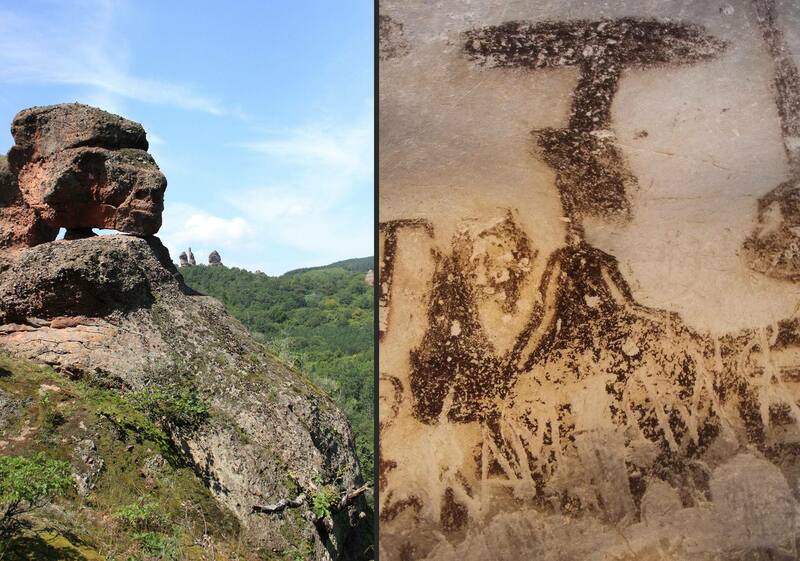 In period 40 000 – 43 000 years ago the Cro-Magnons passes through the Northwest of Bulgaria, where Belogradchik rocks and Magura cave are located. 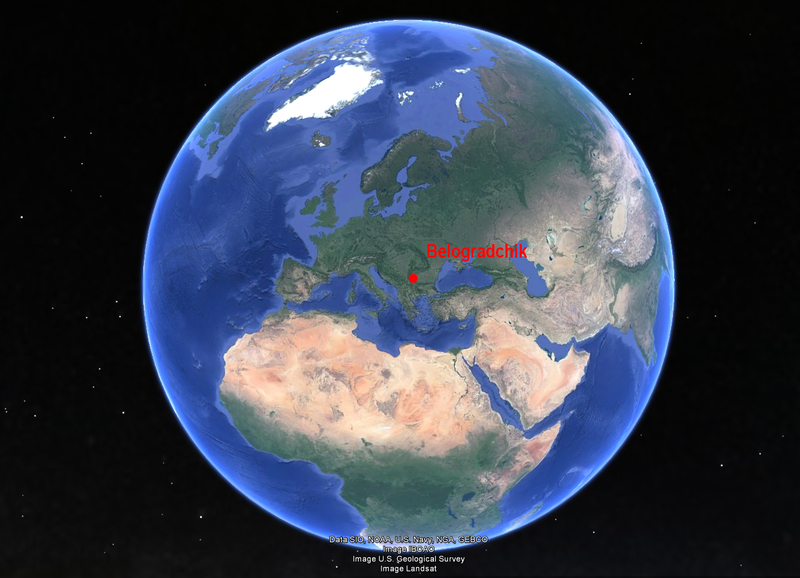 This was the place where modern mankind met the era of Virgo. So, this is the place where human bodies became inhabited by human souls due to enlightenment. 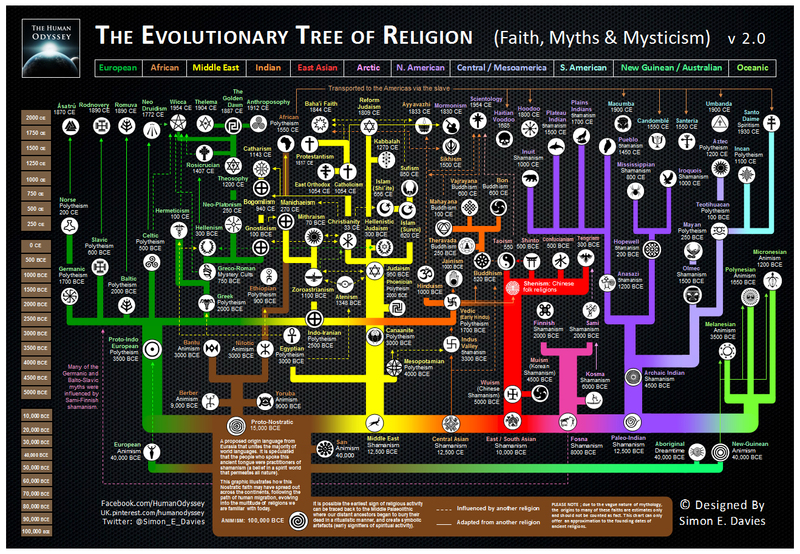 Then we see a diagram of the history of religions. 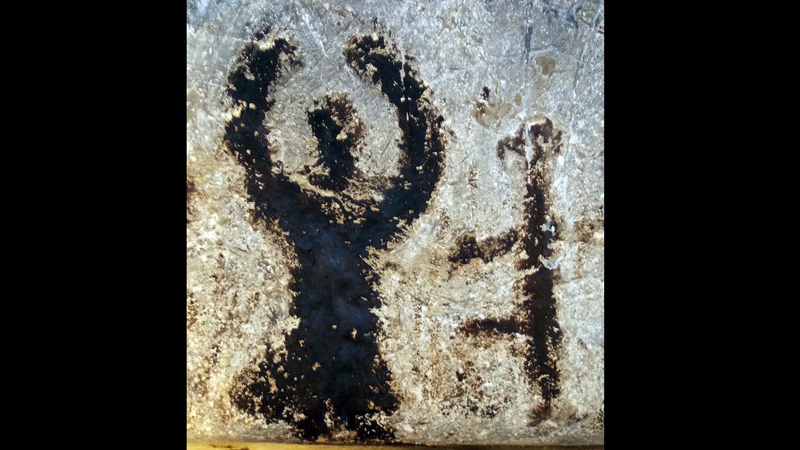 In the lower left corner scientists have placed the European Animism which is the Cult of the Goddess-Mother, which originated in Europe some 42 000 years ago. Hmm, again this number. And where were people at that time? – they were in the vicinity of Magura cave and Belogradchik rocks. Very, very good coincidences from various sources including ancient cave paintings. 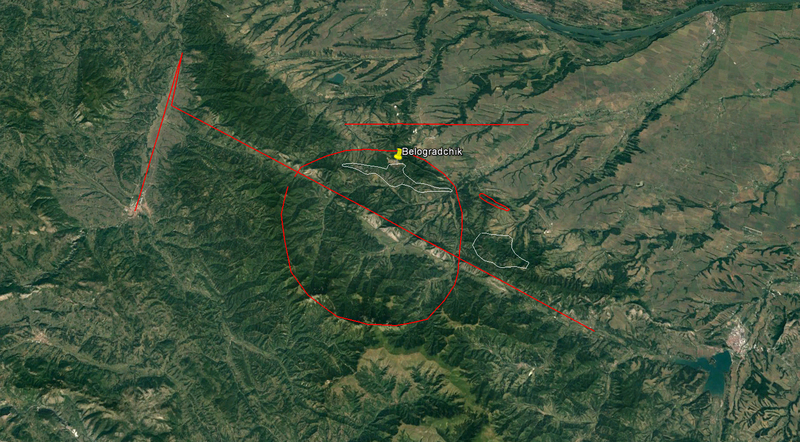 So, we see the repetition of a pattern – when people are in the region of Belogradchik rocks it often happens that they receive development. Probably, only when it is the era of Virgo. She has a flame in her hand – the symbol of enlightenment. And she has the T symbol on her head – the symbol of speech, mind, knowledge. This is the Teacher. A very, very fine specimen it is. And its shape is an exact replica of the Goddess-Mother, the Teacher. Due to some coincidence the long axis of this geoglyph points at 27.5 degrees to the south which is exactly where the Sun rises on 25th of December which is Christmass. Thus we know that the symbol Ф is a representation of the Goddess-Mother and she is the one from whom everything is born. In this way we recognize that the darker content is what is going to be born, it is the embryo. 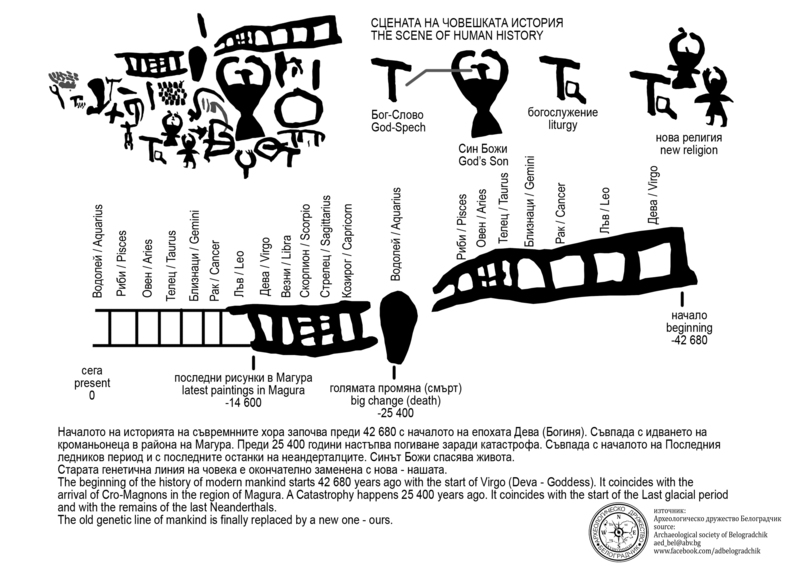 Now pay attention to the fact that Belogradchik rocks are locates in the right part of the geoglyph and you will know that they are what is being born. Now it becomes clear that all the shapes they contain are the shapes of what is being born. Therefore people and animals look like them. And this phenomenon, Belogradchik rocks, seem to become active when it is the era of Virgo and during these periods they transform whoever passes along them and enlighten them. This is why the whole area looks like the painting of the Teacher. 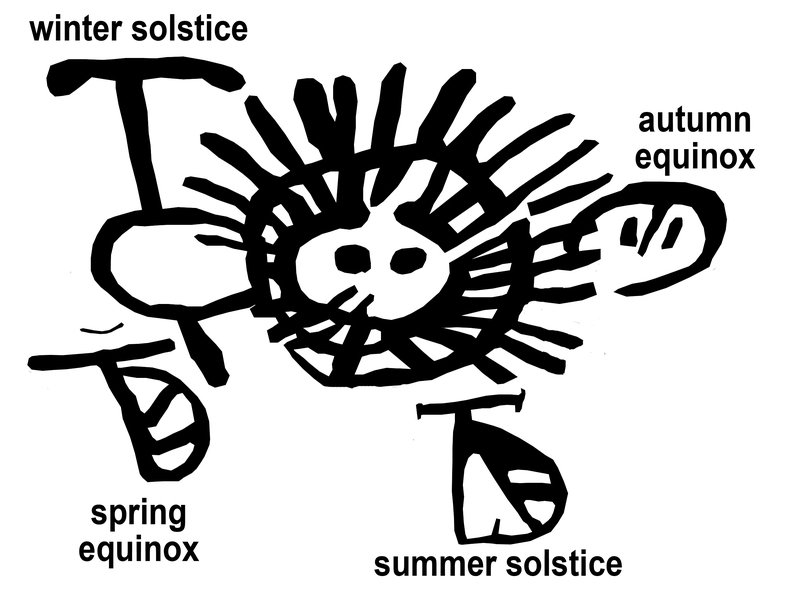 the symbol of the winter solstice is again a derivative from the painting of the Goddess-Mother. This explains why her giant geoglyph points at the sunrise on the 25th of December.